The title of this quartet of films is perhaps no more fitting than it is for In Which We Serve, in which famous playwright Noël Coward was both star and co-director. He was also the screenwriter, of course. At the time, David Lean was known as one of the best editors in Britain, having cut together the Powell and Pressburger propaganda film, The 49th Parallel. Though he was paired up with the actor/writer Coward, most credit would not go to Lean for this first effort. His initial job was only to direct Coward, while the actor/screenwriter would direct the remainder of the cast, though it quickly became clear that Lean was capable on his own. By the time they rejoined for a second pairing, Lean was established as the director with Coward as the writer. With a history in theater, Coward was able to bring the strong influence of language to Lean’s cinematic experience. Together they would make four films, from 1942 to 1945. What began as a propaganda endeavor during World War II became a profitable partnership which helped to launch each into new career endeavors. 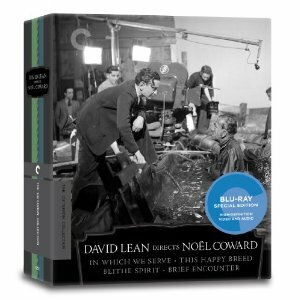 All four films have been included in this spectacular Blu-ray collection, each with new high-definition digital transfers of the BFI National Archive’s 2008 restorations. In Which We Serve comes with a new interview by Coward scholar, Barry Day, as well as a short documentary about the making of the film which was created in 2000. The last feature is an audio recording from 1969 between Coward and supporting actor Richard Attenborough. After the gloriously sentimental propaganda film, Lean would have his first solo directorial credits in This Happy Breed (1944), Coward’s chronicle of a working class family living in a London suburb from the end of World War I to the start of World War II. The British domestic drama features Lean/Coward regular, Celia Johnson, who appears in all but one of the four films. Her debut was successfully delightful in In Which We Serve, playing opposite the screenwriter himself, and she is even more fitting for This Happy Breed. Robert Newton plays opposite as husband Frank Gibbons, and together the pair have three extremely different children who are blessed with joy and tragedy throughout the two decades of the film’s storyline. The disc’s special features include new interviews with Barry Day and cinematographer/screenwriter/producer Ronald Neame from 2010. The third film in the set is a supernatural comedy based on the record-breaking stage play by Coward. It stars Rex Harrison as a novelist who accidentally brings back the ghost of his dead first wife (Kay Hammond), much to the chagrin of his current wife (Constance Cummings). With Oscar-winning special effects, this supernatural comedy is filled with delightful banter and fun visuals. It also has a spectacular supporting performance from the amateur medium played by Margaret Rutherford. The disc’s special features include a new interview with Barry Day along with an episode of the British television series, “The Southbank Show” from 1992, which is about the career of Coward. The last in the collection is perhaps the most recognizable as well. Brief Encounters (1945) stars Celia Johnson as a married woman who happens to meet a married doctor (Trevor Howard) on a train platform one afternoon. They have a passionate flirtation with the possibility of an affair, though it inevitably ends with a whimper rather than a bang. Though tempted enough to meet each other on the train platform, neither are the type of person to have an affair. The interactions are simple and romantic without ever reaching a place of infidelity, making this a bittersweet love story about making the hard choices because they are the right ones. The disc’s special features include an audio commentary with film historian Bruce Eder, another new interview with Day and two short documentaries. One is on the making of the film while the other is a television documentary about Lean’s career. These days another documentary wouldn’t mean all that much, especially due to the ever-increasing ease due to the advances in technology, but even more so due to the subsequent rise in popularity. These days we can easily forget that it wasn’t that long ago that documentaries were rarer onscreen than a foreign film in the United States. This changed with Michael Moore and Morgan Spurlock, who have proved that even a blockbuster documentary is possible. When The War Room was made in the early 1990s, however, there was little attention to the medium or realism in general. This political documentary has seen many replicas since, but the mere trailblazing quality of it in 1993 is what makes it so significant. Directors D.A. Pennebaker and Chris Hegedus, along with producers R.J. Cutler, Wendy Ettinger and Frazer Pennebaker began their filmmaking project with the hopes of getting access to Presidential candidate Bill Clinton during his 1992 campaign. They were denied access to the candidate, though they were instead giving access to film the war room in Little Rock, Arkansas, where James Carville directed the campaign. Having to change the focus of the film meant shifting from Clinton to the campaign staff. The focusing primarily remains on Carville and advisor George Stephanopoulos, both of whom have garnered quite successful and public careers since this film. Though there are some gaps filled with footage of Clinton and his answers in response to the sexual relationship allegations of Gennifer Flowers, more attention is given to the manner in which the campaign workers are able to spin the bad news in a way that makes the Republicans look bad. Politics is entertainment and show business, and these two men are great at what they do. They even convince us that they aren’t aware of the camera being there the entire time. 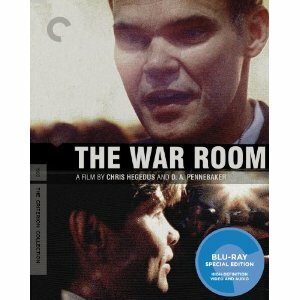 The Blu-ray release of The War Room includes a new, restored high definition digital transfer, approved by directors Hegedus and Pennebaker. There is also a 2008 documentary, Return of the War Room, in which many from the first film return to comment on the influence of their film on how campaigns are now run. There is also new interview footage, including details on the difficulties shooting a campaign. Also included is a booklet with an essay by writer Louis Menand. 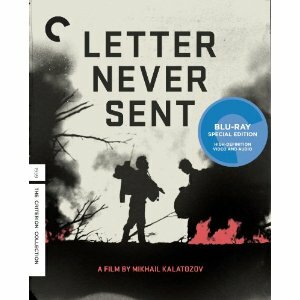 Letter Never Sent was directed by Mikhail Kalatozov, with the distinct style of cinematographer Sergei Urusevsky. Their previous collaboration in 1957, The Cranes Are Flying, and a future one in 1964’s I Am Cuba are better known, but in between them was Letter Never Sent. In 1959 this pair made a tale of human perseverance though extreme difficulty, most unpredictably brought on by the elements of nature. Visually daring in the manner that the film was shot, Letter Never Sent may not be Kalatozov’s most memorable film, but it is one which cannot be dismissed its seat of significance in the history of filmmaking. Based on a story by Valeri Osipov and co-scripted by The Cranes Are Flying screenwriter Victor Rozov, Letter Never Sent is a tale of human expedition which turns into a story about survival in the wild. At the beginning of the tale, four geologists start their expedition in search of diamond beds in the wilderness of the Central Siberian Plateau. The group’s leader is Sabinin (Innokenti Smoktunovsky), whose title letter written homes to his wife is the film’s narration through voiceover for the first portion of the film. The expedition is also paired with a love triangle between the other three geologists on the expedition, which has a second unsent letter. Tanya (Tatyana Samoilova from The Cranes Are Flying) is in a relationship with the passive and peaceful Andrei (Vasili Livanov), while the brutish Sergei (Yevgeny Urbansky) is forced to write out his feelings in a letter which is never meant to be read. This sub-plot becomes somewhat irrelevant when the foursome is in a desperate struggle for their lives. Just as they are able to accomplish their goal and celebrate, their path for escaping the wilderness is threatened by a forest fire. The remainder of the film is a harrowing escape through the perils of the fire and into the equally deadly cold of the Siberian winter. After losing contact with their base camp, their only hope is to keep moving and hope for rescue. As their numbers dwindle down, the film becomes one about sacrifice for the greater good of society. They are each willing to lay down their lives to provide the world with their discovery. The Blu-ray release includes a new high definition digital restoration, with an uncompressed monaural soundtrack and new English subtitle translations. The package also comes with a booklet insert that has production still photos and an essay by film scholar Dina Iordanova. I grew tired of the hype behind The Hunger Games film about five minutes after it began. Popular fiction like The Hunger Games and the Twilight series may come with a built in audience of teenage girls, but the preferences of teen girls has never been an assurance of quality. Maybe these books really do have a compelling story which will come across well onscreen and make lots of money. The last thing that this film is, however, is original. The Hunger Games is simply a watered down rip-off of Japanese filmmaker Kinji Fukasaku’s 2000 film, Battle Royale, and its subsequent sequel. Though it was nominated for 10 Japanese Academy Awards and was critically praised as being poetically violent, only with the release of Hunger Games is this film series being released officially for the first time in North America. Bootlegs and imports are no longer necessary; now these modern foreign classics can be experienced on high definition Blu-ray. The films take place in the near future, where youth has lost all respect for adults. The attendance numbers in schools are down, which causes the government to implement a new law that allows punishment of a randomly selected school. This is the main plot point which makes little sense to me. If they are intending to punish children for not attending school, wouldn’t it be wiser to hunt down those not attending rather than those who still do? It seems that if there is a chance that a school trip will get you killed, it would be a deterrent from school. We join one Jr. High class as they are tricked into a game of Battle Royale, which is led by their former teacher (Takeshi “Beat” Kitano). Each of the students is equipped with an explosive collar, which will detonate if they try to leave the island or if more than one student is remaining at the end of the game. The point of the game is to kill everyone else, pitting an entire class of Jr. High kids against each other. Every student is given a back-pack with food, water and a variety of weapons, ranging from deadly to useless. In an interview with Hunger Games director Gary Ross moaned and complained that there was no relevance between comparing his film with Battle Royale. Though he admits to never having read the books by Koushun Takami or the films which followed, Ross was quoted as saying “I promise you, the main character in Battle Royale didn’t end up in a revolution and become a Joan of Arc leading an uprising.” The thing is, the survivors from Battle Royale return in the sequel to lead an uprising and revolution against the games and adults who started it. Ross is not only wrong, but he promises dissimilarities when he also admits not to have read or seen any material from Battle Royale to know anyway. During the production of Battle Royale II in 2003, director Kinjo Fukasaku passed away, leaving his son Kenta to finish the job as director. The sequel has new rules for the fighting 9th graders, who are now sent in to fight against the leaders of the revolution, instead of against each other. If they can’t kill the revolutionaries, they will die themselves. The four-disc collection includes both the theatrical and the extended director’s cut of Battle Royale, each on their own disc. The third disc contains the sequel, with a fourth bonus DVD for over two hours of special features. There are so many special features that it is difficult to know where to begin. It seems easier to list what is missing. There are a number of documentaries which cover the making of the films, as well as a trailer gallery. There is also footage from the press for the film, including festival interviews. More behind-the-scenes footage can be found in the rehearsal footage as well as special effects comparisons. With over two hours of extras to peruse, we have gone from having no Battle Royale to an excess. 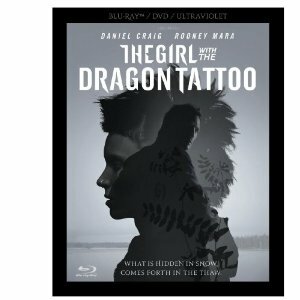 I can understand why David Fincher would be chosen as the director of a film adaptation of Stieg Larsson’s best-selling thriller. The storyline alone seems fitting the director’s best work, dealing with a series of unsolved murders and relentless investigating. Throw in some sexual deviancy and graphic violence and you have a Fincher film not unlike Seven or Zodiac. The only problem with this adaptation is not the choice of Fincher as the director, but the relevance of a North American film adaptation when one has only recently been made in the book’s home country of Sweden. All three of the novels have already been made, and although I appreciate Fincher’s stylistic choices and musical accompaniment much more than the Swedish version, another adaptation was wholly unnecessary to begin with. The film follows a number of rabbit holes as far as a plot is concerned, leading to a climactic sequence which is followed by another twenty-minutes of storyline. The basic storyline involves a forty-year-old missing person’s case, which is believed to be an unsolved murder. Journalist Mikael Blomkvist (Daniel Craig) is hired by the victim’s uncle, Swedish Industrialist Henrik Vanger (Christopher Plummer), who first hires professional hacker Lisbeth Salander (Rooney Mara) to investigate Blomkvist. Both impressed and horrified by the amount of personal information Salander was able to obtain, Blomkvist hires her as a research assistant in the investigation. This unlikely duo uncovers the secrets behind the Vanger family, most of which live together on an island without speaking to each other. Though I don’t necessarily recommend this film to anyone other than die hard Fincher fans such as myself, I may recommend it over the Swedish version. This is because of my personal preference to Fincher’s visual style, but even more so due to the spectacular score by Trent Reznor and Atticus Ross. Similar to their award-winning work on The Social Network, it is a lot of pulsing and droning which helps fuel the energy of an occasionally anticlimactic suspense thriller. The DVD includes a feature commentary track with Fincher, who is always articulate and entertaining in his explanations for filmmaking choices.